WHY IS GLAUCOMA TUBE SHUNT IMPLANTATION NECESSARY? 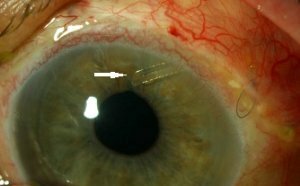 Glaucoma tube shunt implantation is performed for patients with worsening glaucoma or uncontrolled high eye pressure despite being on medications. A functioning glaucoma tube shunt reduces the eye pressure, which in turn reduces the risk of further optic nerve damage from glaucoma. The two glaucoma tube shunts currently available for use in Australia are the Baerveldt and Molteno tubes. Both are equally effective at reducing eye pressure. 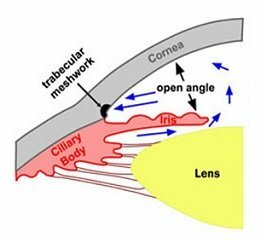 WHAT DOES A GLAUCOMA TUBE SHUNT DO? ● Applying an anti-scarring medication (mitomycin-C) to prevent scarring. ● Fixing the shunt plate to the wall of the eye, underneath the eye muscles. ● Occluding the tube to prevent uncontrolled aqueous drainage. ● Inserting the end of the tube into the eyeball. ● Placing donor sclera tissue over the tube insertion site to prevent erosion. overlying the sclera). This forms a pocket of fluid called a ‘bleb’. Aqueous will drain from the eyeball via the tube into the bleb and become absorbed by surrounding blood vessels. This decreases the eye pressure. Glaucoma tube shunts have a success rate of around 70-80%. 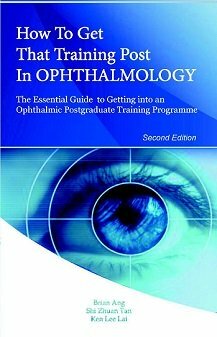 Most complications can be treated, although sight-threatening complications may occur rarely (less than 1 in every 1000). These can sometimes occur even if the operation has been carried out perfectly. after 3 months if the pressure remains persistently high. shunt may have to be removed. needle to free up the shunt plate and bleb (bleb needling procedure). 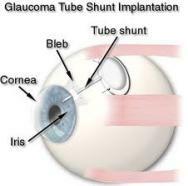 Glaucoma tube shunt implantation is a hospital-based day case procedure usually performed under local anesthetic. The operation is usually performed one eye at a time. You will be awake during surgery, but you should not feel any pain. If you feel discomfort or pain, additional local anesthetic can be given. It is normal to notice bright lights or colors, hear buzzing and beeping sounds, and feel cold water running down your cheek or ear. You will need to lie relatively still for up to 90 minutes for the operation. At the end of surgery, you may feel a sting due to an injection. Over the next few weeks, you will experience blurriness, discomfort, sensitivity to light, and blood around the eye. These will gradually improve over several weeks with the eye drops. You will be reviewed the next day, and then weekly for a few weeks after surgery. During these visits, you may receive injection of an anti-scarring medication (5-fluorouracil) around the bleb. The visits (and injections) will become less frequent as the eye settles.